When we consider the new ecosystem of the Social Age, we can look at some very specific changes, foundational shifts that trigger new modes of social organisation, emergent structures of power, and evolved behaviours in both individuals and groups. Our functional shift in the structure of knowledge is one of these. I tread carefully here: ‘knowledge’ is one of those tricksy subjects, something we both understand well, and yet treat somewhat carelessly. I wrote a short book on ‘Learning, Knowledge, and Meaning’ a few years back, as something of a personal journey to consider the nature of knowledge, and learned quite a lot: predominantly, i learned that i don’t know much. In this article, i’m not talking about the knowledge that we access everyday. Pragmatic knowledge. What we know, and the stuff we need to know ‘well enough’. This type of knowledge is just as important as any kind of arcane ‘deep truth’, the types of knowledge guarded in secret vaults by ancient monks. In very real and practical terms, two things have changed: the nature of knowledge itself, and our relationship with it. Put simply, we are moving from a world where ‘knowledge’ tended to be formalised, codified, captured, and centralised, towards a world where it is increasingly co-created, adaptive, contextualised, accessible, distributed, and evolutionary. Feel free to pick holes in any of that: it’s an imperfect description, but it illustrates the point that ‘knowledge’ has escaped from the covers of books and the doors of the library. In fact, i was very taken by a particular door in Morocco, when given a tour of a religious library: the door in question was twelve centuries old. I’ll say that again, for my American friends, who may have considered it old one decimal place to the left. Twelve hundred years that door had stood at the entrance to a library. The door has four locks: one for each of the four scholars who guarded the knowledge. The books were locked away, kept safe from people, and the knowledge within their covers kept safely for those who could interpret it best. All four scholars had to come together to open that door. From there, to Wikipedia. Things have changed. Let me put some structure around precisely what. Perhaps we can fairly say that we used to access knowledge primarily as individuals, from books, from teachers, whilst today, we tend to access it within, and through, communities. Indeed, in my Social Leadership work, i describe how our communities (both formal, and social), are our primary ‘sense making’ entities, our primary space to figure out just what that knowledge ‘means’. That dynamic, from ‘knowledge’, to ‘meaning’, was one that i explored in my first book: taking a view that ‘knowledge’ was the raw material, and ‘meaning’ is what we create out of it. In this context, the community helps us to find meaning. Not everyone would agree with my flow there, but that’s ok: part of learning is to figure out how we understand a subject (our own ‘sense making’), and for me, that analogy works just fine. So the more, and better, ways we have to access knowledge, the better off we are, but we also need strong ‘sense making’ capability, to tease out the meaning (what it means to us, to our thinking, to our understanding, and how it informs our actions). Today, much of our knowledge, and sense making, takes place within our communities. Multiple, overlapping, often conflicted, social structures. 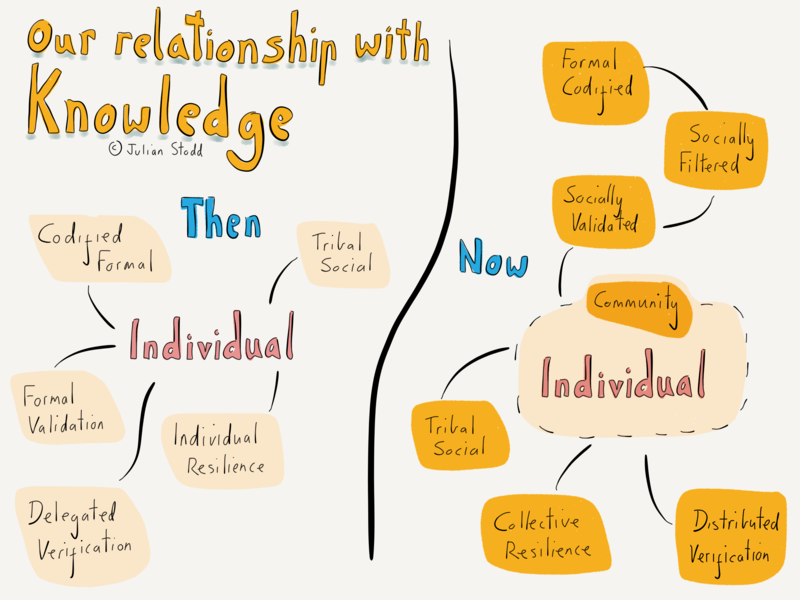 Historically, we would access knowledge directly, but on the right hand side of the illustration, i’ve tried to capture something of the dynamic of how we access it today. Clearly we interact directly, but there are also layers of social filtering, social amplification, and social validation (and be clear that i am not saying that all of these things are good!). To large extent, the knowledge that we access it both influenced by our community, and constricted by it, but also processed and filtered. Good leaders, Social Leaders, have a responsibility to understand just how: to be able to build out a broader, more balanced, dynamic community, and to understand how bias and influence flows through it. Put simply, the more interconnected and diverse, our community, the more balanced and diverse our access to knowledge, and ability to find true meaning. I’ve also used a term ‘resilience’, which i’m taking to mean our ability to change our minds, or hold a position, particularly as new knowledge emerges. Part of learning is ‘disturbance’: exposing ourselves to different points of view may pollute our own thinking, and change our minds. That’s kind of what learning is: exposing ourselves to pollution of our existing knowledge, and being open to create new kinds of ‘meaning’. Creative and constructive cognitive pollution! When we learnt alone, our resilience was individual, but learning within communities, our resilience may be more collective. This brings both benefits, and risk. I’m particularly interested in social movements, and the flows of belief (which is really one type of ‘meaning’) through communities. It’s clearly not simply a rational or logical process: it’s a type of mass hysteria. Look at the debate around self driving cars, which is not logical (how many people get killed on the roads everyday), but rather a collective hysteria about the rise of the robots, and the relinquishing of control. We are not logical beings, indeed, we are at our most content when irrational and irrational together. A great deal of concern swirls around our communities around ‘validation’, what can we take to be reliable knowledge, to be ‘true’. One thought that struck me is how we have partially moved the location of verification: when we interacted more directly, and individually, with knowledge, we relied on both direct, and delegated, approaches to verification: we trusted that authors, and the commissioning and distribution process, addressed at least some aspects of validity. If it was in print, it was, to some extent, imbued with truth. Perhaps today, we rely more on collective, or distributed, verification: so we use external validators, specific ‘fact checking’, high reputation, sites, as well as relying on personal reputation. In this context, our communities are stronger if we recruit high reputation, strong verifiers. Understanding how both knowledge itself, and our relationship with it, have changed, is essential to understand the evolution of learning itself, and the ways in which we should evolve the structures of learning in formal and semi formal contexts. 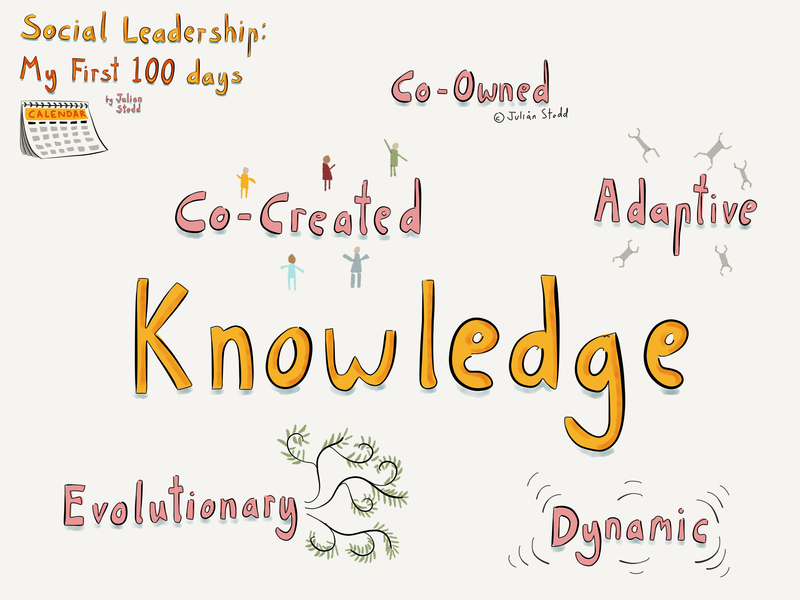 Broadly, organisations should be moving away from codified knowledge, which they own, centralise, validate, and control, towards more diverse ecosystems of distributed knowledge, and more capable sense making communities. This entry was posted in Knowledge, Learning and tagged Adaptation, Community, Epistemology, Knowledge, Learning, Meaning, Pragmatism, Social Leadership, Social Learning. Bookmark the permalink.